This scene also makes use of the Proximal shader. As you may have guessed from the name, the Proximal shader works based on the proximity of objects. In other words you can use it to control a material when it is near another object, edge, vertex, etc. Take for instance a hot iron branding some skin. You could use proximal in the skin luminance channel, place it in a layer shader as a layer mask to reveal a glowing red colour. Point Proximal at the Branding Iron object and set the Start / End Distance and the Intensity. As the branding iron object moves towards the skin object, the proximal shader will get whiter. As it is used as a mask, it will reveal red coloured shader. As for the TP side of things, I’ve created a simple Surface Emitter and then dropped all the particles down using PGravity. The particles bounce off the surface using the PDeflector node. The surface that they bounce off has the proximal shader. I’ve used it in the displacement channel and also in a layer shader in the colour channel. So as the particles get close to the surface, they make dents and they also change the colour. Of course there are a lot more creative uses for this technique, but hopefully this simple example will whet your appetite and you will put it to a more suitable usage! How about emitting particles from the rear of a boat to stir up some wake. I remember JeremyW had a superb example of just that a few years back. For those of you who don’t have Thinking Particles or just like to experiment. This type of technique is certainly possible using MoGraph too. You can use TP particles as the source for falloff on the Shader Effector and the Displace Deformer. If you don’t have TP then why not use MoDynamics to drop the clones down onto the surface? 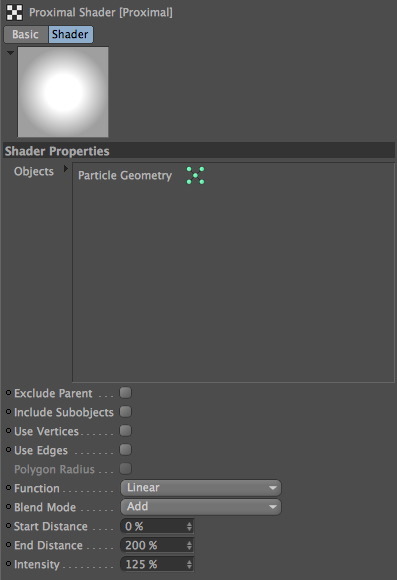 I hope you find this useful and you are inspired to use the Proximal shader in your own projects. You can download the Cinema4D scene file here. So glad you finally started resurrecting these olden goodies. Great tip. 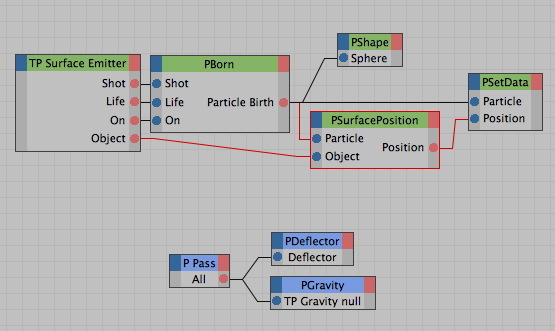 I see you offer an alternative approach using Mograph, but why is this not possible using Mograph as the particle geometry (replacing the old particle geometry). I tried using a connect object to see if that would do it, but no luck…Why is this? Is Mograph not sending the right type of data about its clones? Is there any way to make the proximal state samples remain in the texture? what I mean is that I don’t want the shader to get back to its original state once it’s been modified by the proximity of the other object. Thank you! Using the displacement shader requires rendering to see the results but using the geometry from a cloner allows a deformer and thus the Displacer Deformer which shows the results without rendering (now off to create a file and confirm that this works).